Since The Kid has a dairy allergy and has from birth, she’s never had many of the things most of us take for granted. Ice cream, cheese, milk… ranch dressing. Now that she’s older, she sometimes asks me what such and such tastes like. It’s hard! Have you ever tried to explain the taste of mozzarella to someone who’s never had any kind of cheese?! That’s a tough one. Just for fun, I play around at times with recipes for things that are usually dairy based but I make them dairy free. Like the vegan alfredo sauce, lasagna, and spinach mushroom quiche. It’s crazy what you can actually do without diary that tastes pretty good. I’ve made ranch dressing a bunch of times using tofu and it’s a fun way to get a flavor of ranch without all the fat that usually comes with it. Mix all of the ingredients except the water in a Magic Bullet, small blender or food processor. Blend until smooth. You may need to add just a splash of water to get it to the consistency you like. The amount depends on how much water is in your tofu and how thin or thick you like your dressing. I use mine as a dip so I like it thicker than bottled salad dressing. Makes 4 servings at approximately 63 calories per serving – 3g protein, 4 g fat. The recipe is simple and you can also make different variations. 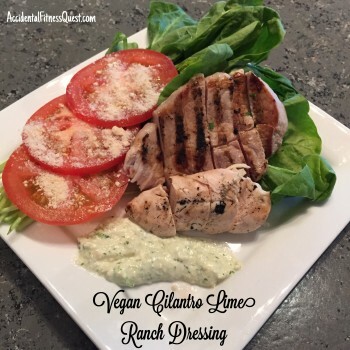 You can use chives and lemon juice instead of cilantro and lime for a more traditional ranch flavor. Add hot sauce for a spicy ranch or even mix it with a little barbecue sauce for a BBQ ranch. I’ve also used firm tofu for this recipe when I didn’t have silken. The silken will give you a smoother texture and the firm is more of a dip or spread consistency without water. The taste is the same though. I had ours last night with grilled pork chops and tomatoes along with fresh spinach. It was the perfect way to end the day. How would you describe the flavor of mozzarella?